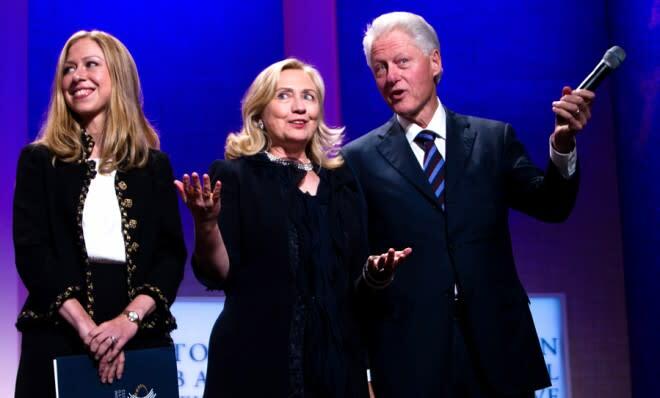 The Bill, Hillary & Chelsea Clinton Foundation: New name, a whole lot of old baggage. Hillary is moving into the headquarters of what is now the Bill, Hillary & Chelsea Clinton Foundation. That's where it gets tricky. Nothing is ever simple when it comes to the Clintons. Take the Clinton Foundation, the philanthropic behemoth founded by former President Bill Clinton shortly after he left office, which has been officially renamed the Bill, Hillary & Chelsea Clinton Foundation. It's not just a symbolic change. Hillary Clinton and her staff are moving into the organization's headquarters in midtown Manhattan, where she will spearhead new initiatives focused on women, children, and jobs, according to a lengthy new profile of the Clinton Foundation in The New York Times. If Clinton — who is currently polling ahead of every potential presidential candidate — decides to run in 2016, her image will be inextricably linked to the multi-million dollar foundation that now bears her name. In some ways, that could be a positive. The group's largest project, the Clinton Health Access Initiative, has been praised for negotiating lower prices for HIV drugs and helping distribute water-purification packets in developing countries. The Clinton name, however, is often a double-edged sword. Here are some ways Hillary's increased involvement with the Clinton Foundation could complicate things for her in 2016. 1. Baggage. Lots of baggage. In 2011, the Clinton Foundation hired outside lawyers to conduct the organization's first-ever internal review. "The review echoed criticism of Mr. Clinton’s early years in the White House," wrote Nicholas Confessore and Amy Chozick in The New York Times. "For all of its successes, the Clinton Foundation had become a sprawling concern, supervised by a rotating board of old Clinton hands, vulnerable to distraction and threatened by conflicts of interest." The Clinton veterans include Ira C. Magaziner, who helped run Bill Clinton's failed health care reform attempt in the 1990s, and "is widely seen within the foundation as impulsive and lacking organizational skills," according to the Times. Then there is Douglas J. Band, a former aide to Bill Clinton, who started a corporate consulting firm (more on that later) while overseeing the Clinton Global Initiative, raising concerns about a conflict of interest. SEE ALSO: Should White House interns be paid? That made The Atlantic's Conor Friedersdorf wonder, "Would the surfeit of loyalists [Hillary's] accumulated displace the hiring of staffers with needed outside perspectives, or a newbie's focus on advancing the country rather than Team Hillary?" The Times reported that in 2007 and 2008, while competing with Hillary Clinton's presidential campaign for cash from Bill's network of donors, the Clinton Foundation found itself with a $40 million deficit. Last year, it was $8 million in the red. Instead of tightening its belt, the Clinton Foundation has regularly catered to big-name donors and celebrities, including buying a first-class ticket for actress Natalie Portman and her Yorkie during a Clinton Global Initiative event in 2009, reported the Times. That's not exactly the image Hillary Clinton wants to project while preaching fiscal responsibility on the campaign trail. SEE ALSO: Why do smart kids grow up to be heavier drinkers? In the long wake of Whitewater, shady business deals aren't what Hillary Clinton needs in the run-up to 2016. That's why she might be concerned about Teneo, a corporate consulting firm founded by Band that charged monthly fees as high as $250,000, according to the Times. Band recruited former Clinton aides and Wall Street executives to work with him, and even took on Bill Clinton as a paid adviser. Teneo also recruited clients who were Clinton Foundation donors, using Band's connection to the Clintons and the organization itself as selling points. That led some foundation employees "to wonder where the foundation ended and Teneo began," according to the Times. Then, one of Teneo's earliest clients, MF Global, collapsed in 2011, despite paying $125,000 a month for the firm's financial advice — causing the former president to distance himself from the company. Close ties between executives of companies like Coca-Cola, Dow Chemical, and Standard Chartered — which paid a $340 million fine last year to regulators over charges that it laundered money from Iran — and the Clinton Global Initiative have also raised some eyebrows, although the foundation has claimed that it "has established clear guidelines for the Clinton Global Initiative to help prevent any favoritism or special treatment of particular donors or sponsors." "The cynical might infer from the NYT piece that the Clintons are willing to sell themselves, their image, and even their Foundation's reputation in exchange for money to finance their personal projects," wrote The Telegraph's Tim Stanley. "In Bill's case, saving the world. In Hillary's case, maybe, running for president."